1,3 without fan (model SB100). Secondary cord: 2 m (SB100P/F and FC100F), 5,5m (FC100XFE) and 6 m (SB100PXF). Ultra-compact luminaire with dischargeable mercury lamp, integrated reflector, separate filter, rubber support for filter. Manual dismantling of luminaire without any special tools. Shock resistant and hermetically sealed design. Advantage of this spotlight in comparison with ordinary versions - power and easy-to-handle, lightweight lamp with high efficiency. Overall dimensions and weight are on 30 % less than those of standard spotlights with lamp PAR 38 100S/M. 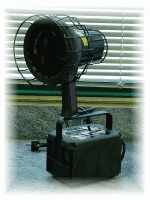 Instantaneous switching on, stabilization time makes up about 19 seconds, instantaneous re-start at high temperatures. Xenon lamp with micro-discharge of 35 W with insignificant heat losses, the arc is stable even when using for the magnetic flaw detection, the arc is resistant to the magnetic blowout. Weight of upper part is reduced to 1 kg due to "wrinkle-proof" synthetic body. The luminaire is equipped with rubber shock-resistant filter. Manual dismantling of luminaire without any special tools. Powered from line supply of 230 V or from battery of 12V when carrying out inspections in production conditions at low voltage (relates to the luminaire Maxima 3500M only). 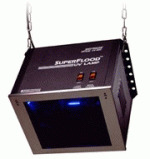 Equipped with lamp in double capsule and integrated filter for filtering UV-B. Contains from 2 to 6 lamps located so that the luminaire could illuminate large space. Mercury lamps are used. Equipped with separate cobalt Wood filter. Creates ideal visual comfort (maximum of UV-A rays, minimum of visible light, generating interferences). Lenses are protected with metal caps. Body under ventilation. Hinged front panel facilitates the access to the lamps. Intensity of incident radiation along the axis of the lamp: ? 9500 mcW/cm?, between 2 axes: ? 2000 mcW/cm? Sealed with sealing rings, adpressed to the lamp. The use of hermetically sealed surface mounted luminaires encased is not desirable: bodies from polycarbonates hamper UV-A. Air neon. 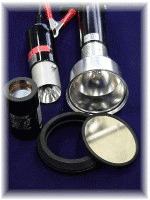 This equipment is provided with flame safety lamps. Luminaire is designed for two UV lamps. Length 1,2 m or 60 cm. Special wide-band tube UV-A designed for the washings only: spectrum emitted by this lamp is the source of external UV-A radiation. Part of the premise being illuminated with visible violet light, which provides the favorable conditions for the operator work. Such external illumination allows avoiding any temporary blindness of the operator when he comes outside as well as contributes to the quick adaptation to classical lighting with invisible UV rays at the entrance into the rinsing compartment. Single metal halide lamp with ferromagnetic ballast and starting electrode. Lighting source UV-À 6000 mcW/cm? to 40cm. Minimum service life of the lamp makes up 1000 hours. Illuminates the area of format A3 size with minimum intensity of 2000mcW/cm? (new lamp). Parabolic reflector with high reflectance within the UV spectrum. Dimensions: 38*30,5*30,5cm ; weight 16,3kg. 12 V or 24 V AC or DC. UV radiation: is connected to the second socket of transformer (to the first socket the metalloscope 48 V is connected), or to any other power source of 12V or 24V alternative or direct current. To control the rinsing at different stages of liquid penetrant inspection. 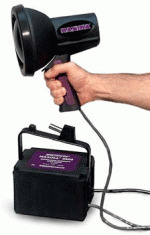 intensive UV radiation: connected to the second socket of transformer (to the first socket the metalloscope 48 V is connected), or to any other power source of 12V or 24V alternative or direct current. Excellent colorimetric detection due to the filter "UV Blue "
Excellent colorimetric detection due to the filter "UV Blue"
Rechargeable diode torch - source of intensive UV-A. New luminaire, source of UV-A radiation, wave length 365 nm, band width 7nm. Visible light, creating interferences: about 1 lux per 1000 mcW/cm?, which makes possible the use of the torch for non-destructive testing by fluorescent methods. It is also very efficient for the search of leakages when used with fluorescent indicator. Supplied in the box with charger. Luminaire Optimax 3000, source of blue actinic rays, completed with goggles UVS 40, is an alternative to UV-A lighting fixtures, traditionally used for the liquid penetrant inspection. It is very convenient for local inspection at the finalization or disambiguation. Blue diode lamp of OPX3000 completed with special goggles UVS 40 allow the use of luminaire at the non-destructive testing by fluorescent methods without sight cabin under shop lighting. The principle of luminaire operation is simple: blue actinic rays stimulate the fluorescence of pigment without coloring it in blue, like it happens in ordinary UV-A sources. As the pigment is the main element of penetrant, its intensive exposure to blue rays radiation is admissible; the pigment acquiring intensive shine without saturation. In the handle there are 4 storage batteries and connector adapter. Diode 365 nm emits UV-A, that is transferred by optical fiber bundle 1mm long and 6mm in diameter. The eyepiece graticule is focalized by ring, 6000 mcW/cm? to 2 cm and approx. 5 lux. Excellent quality and reasonable price. Rechargeable pocket torch of UV-A, wave length 365 nm. - Intensity of incident radiation on 2cm: about 1500 mcW/cm?. - Diameter 1 cm, effective length 5 cm. - Total length 13 cm.